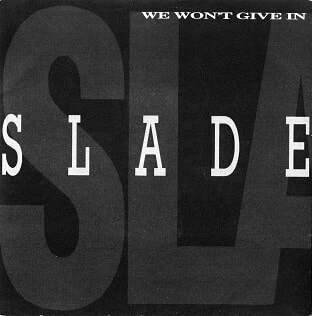 We Won't Give In is Slade's fourth and final single from their fourteenth studio album You Boyz Make Big Noize. Released by Cheapskate Records on 27 November 1987, it failed to enter the UK Top 100 but reached No. 121. The song was written by Noddy Holder and Jim Lea, and produced by Lea. Following the moderate success of the band's 1985 albums Rogues Gallery and Crackers: The Christmas Party Album, Slade began writing and recording material for their next album in 1986. The band hoped to record a hit album that would put them back in the public eye. "We Won't Give In" was first released in 1986, prior to its inclusion on the You Boyz Make Big Noize album. It appeared as part of the soundtrack to the 1986 film Knights and Emeralds, which also featured another Slade song "Wild Wild Party". Although the film company had hoped to release the song as a single, RCA refused to give them permission to do so. In 1987, You Boyz Make Big Noize and its singles all failed to achieve the expected level of commercial success. The disappointing chart action resulted in the end of the band's contract with RCA. The band then reverted to their former independent label, Cheapskate Records, for the release of their July 1987 single "You Boyz Make Big Noize". Later in the year, Lea suggested to the band that they should consider releasing the song as a single in the attempt to attract the Christmas market. In a September 1987 fan club interview, Lea said: "I want to release "We Won't Give In" as a single this Christmas. I feel that it is a good idea, because whichever way you look at it, we have the wind blowing behind us at that time of year. Last Christmas we were offered five TV shows and we hadn't even got anything out. Unfortunately, at the moment, nobody else seems to share my point of view over this and would rather keep Slade away from Christmas this year." Eventually the band agreed to release the song as a single. In November, "We Won't Give In" was released on the Cheapskate label, with permission from RCA/BMG. Initial expectations were high as the song began picking up airplay on BBC Radio 1, and also received positive comments from DJs. Furthermore, hundreds of fan letters requesting airplay of the song were sent out. In December, DJ Bruno Brookes revealed on his show that he had received hundreds of fan letters requesting he play the song. Despite this, the song failed to reach the UK Top 100, stalling outside at No. 121. It was the band's first UK single of new material to fail to chart since 1981's "Knuckle Sandwich Nancy". In a 1988 fan club interview, Don Powell said of the song's failure "I really don't know why we have problems like that. We just seem to get the token plays, but the records tend not to bite and get dropped. Obviously we are disappointed and will have to decide what we are going to do next. At the moment, no-one in the UK seems to want to know. We never seem to get any recognition for anything we do. Even rock encyclopaedias about the 70s never mention us and the BBC have virtually ignored us in their Rock and Roll Years programmes." Describing the song as a "heavy ballad", Holder said in a 1988 interview of the "You Boyz Make Big Noize" and "We Won't Give In" singles: "Everyone we spoke to loved both of those records, but they just didn't catch on at all." "We Won't Give In" was released on 7" by Cheapskate Records in the UK only. The B-side, "Ooh La La in L.A.", was taken from You Boyz Make Big Noize and was also a failed single from the album. No music video was filmed to promote the single. In December 1987, the band performed the song on BBC One's lunchtime show Daytime Live. Kerrang! commented: "Slade have a habit of getting a big hit every five years just when they seem to be on the way out again, and this might well do it for them. It's rather slow and measured and a shade gloomy for Christmas fare, but it's good to hear Noddy Holder roaring away. And don't forget this is the band that influenced many a later mob." In a review of You Boyz Make Big Noize, American newspaper Record-Journal wrote: "Songs, such as side one's "Still the Same" resplendent in its anthemic arrangement and heavenly harmonizing chorus, is not only a hook-filled, powerful tune, it's a primer for anybody who wants to be Jon Bon Jovi someday. Likewise for "We Won't Give In"." In an AllMusic review of the 2007 Salvo compilation The Collection 79-87, Dave Thompson said: "Songs like "We Won't Give In" may veer a little closer to generic hard rock than Slade really ought to, but that was the sound of the '80s, just as the glam stomp was what powered their years of omnipotence." In the liner notes of the 2007 Salvo remaster of You Boyz Make Big Noize, writer Chris Ingham said: ""We Won't Give In" is the closest thing to a bona fide Slade classic on the album. A rousing, attractive anthem of resolution in the face of harshness, it rings out like a theme song for Slade and their inspiring tenacity." Jim Lea - keyboards, bass, backing vocals, producer of "We Won't Give In"
John Punter - producer of "Ooh La La in L.A."